Joe's Garage are Punk rock in its purest and rawest form. With an age range from fourteen years old to sixteen years old and influences from bands like The Crowd, The Cramps, GG Allen, The Imposters, The Adicts, The Dickies and The Clash there is no set pretense or pose. They are what they are. . . punk rock kids playing punk rock music without worrying about what is "cool" or trendy. When the band played their one year anniversary show on October 25 at Hogue Barmichaels in Newport Beach, California their set included originals like "McNazis," "OCD," "Kid," and "The Eye," along with a cover of GG Allen's "Bite It, You Scum." The band brought an erratic energy to the stage and showed that they can rock and still have a sense of humor. 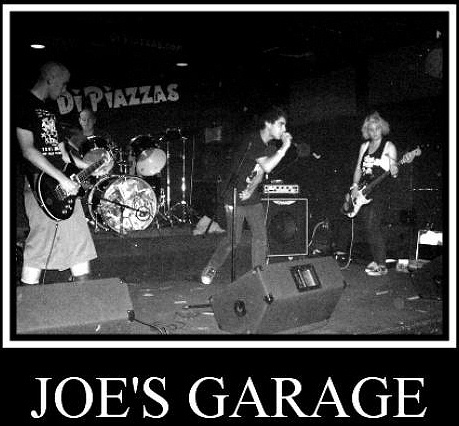 According to the band, who are named after a Frank Zappa album, Joe's Garage formed out of the ashes of a rockabilly influenced band that Mike (guitar) and Josh (drums) were in. After they decided that they wanted to play music with a more punk rock edge they added Joey on vocals and Lily Stretz (the daughter of JFA/Crowd/Outsiders bassist, Corey Stretz) on bass. Though they do have some live recordings they plan on doing proper studio recordings in the future. With shows coming up with Lower Class Brats, Joe's Garage are a band not to be missed.